On my to do list for today has been figuring out how many grams a repeat of the nahant scarf costs. I figured it out, it’s 6 grams. Of course, I’ve got far more important things to do on my list, but this one got done pretty early in the day. As you can see, I am transitioning out of the red and into a turquoise. The transition seemed to take forever! 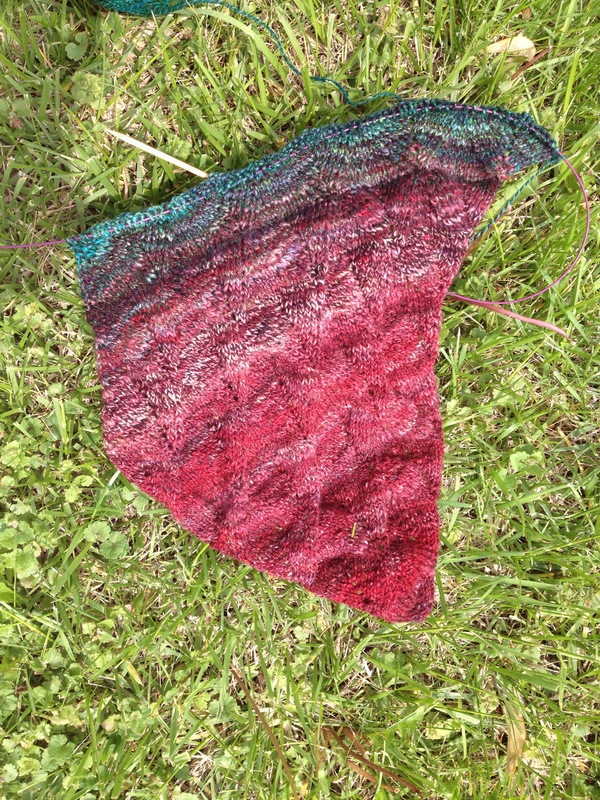 I am really enjoying the shawl though, it’s been an absolute pleasure so far. We’ve also managed to sort all our art. This is about a week and a half later than I had hoped! Because I just cannot feel settled until the art is in place. We hung some of it late last evening as well, but there’s still much to be done. But, every day sees more boxes unpacked. Our saving grace has really been all the storage space in the home. We’ve been able to live comfortably without tripping over boxes, just bringing one or two up at a time to sort and put away. That being said, I do struggle a bit now to keep up on all the regular type cleaning while also getting stuff unpacked and organized. Happy weekend friends! I do hope you have a good one! I love the colors!!!! I can’t wait to see more of the turquoise come out because it’s kindof my favorite color.